There is a small Buddhist temple close to Sanchih (aka Sanjhih or Sanzhi), Taiwan, whose walls are almost completely covered with sea-shells. 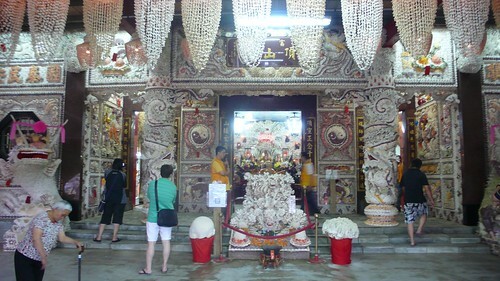 Popularly known as Sea-Shell Temple, its entire interior is beautifully decorated with pictures/mural created by using sea-shells and corals. Very little info is available about this temple except that its Chinese name is Pei Khe Miao. The beauty of the interior can be visualised by the images and the YouTube video given below.